Founder, Philip Cirimotich (pictured left) and two other investors incorporated Aluminum Castings Corporation in September of 1964. Philip at the time was Plant Manager of Galesburg Malleable Company, a malleable iron and ductile iron foundry, also in Galesburg, IL. Property was purchased at 340 South Kellogg Street, which was previously run as a chicken hatchery of 2300 square feet. The business was started as a reaction to iron casting customers having difficulty finding a source for their aluminum sand casting needs. Modest growth was realized through the mid 1970’s with several building expansions to accommodate the early years. In 1976 Philip left Galesburg Malleable Company and purchased all outstanding stock shares, to become the sole owner of Aluminum Castings Corporation. His son, Roger (pictured right), joined the business as metallurgist and general manager in 1982. Roger graduated in 1973 from Colorado School of Mines with a B.S. in Metallurgical Engineering, and gained valuable aluminum and foundry experience working for Alcoa Aluminum (Heat Treat Metallurgist for aluminum rolled sheet), International Harvester Ductile Iron Foundry in Memphis, Tennessee (Chief Metallurgist for their three shift operation), and Metallurgist and Technical Sales Manager for Blackhawk Foundry in Davenport, Iowa. Lana Rush(pictured in the center), Roger’s sister, joined the company in 1984 as CFO and Office Manager. Her knowledge in accounting and ability to learn the foundry production process was invaluable to the large growth and success in the business through the following years. From 1994 to 2000 capacity was increased by updating melting facilities to six state of the art gas fired melting furnaces and adding a new solid state controlled sand system with a B&P automatic molding machine. 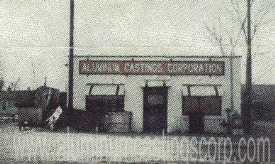 The original Aluminum Castings Corp. building, picture taken in 1964. Effective January 27th, 2011 Alcast Company permanent mold aluminum foundry along with Bret Markum and Tony Kelsey purchased the Aluminum Castings Corporation sand foundry in Galesburg IL USA. Alcast discovered two exceptional foundry people to run the company and become partners and Co owners. Both Bret and Tony have decades of experience with aluminum sand castings and together Aluminum Castings Corp. will be grown and modernized. In the Spring of 2012 a major expansion of the aluminum sand foundry was complete which included a new 11,500 sq. ft. addition. Shortly following the expansion a new mold handling system was completed in the summer of 2012 along with the installation of new air set or no bake molding equipment. Finally in the fall of 2012 factory rearrangement along with other modernizations were completed making the aluminum sand foundry much more efficient, modern and productive. Aluminum Castings Corporation is now setup to provide you with all your high quality aluminum sand casting needs in several aluminum alloys, high or low volumes, small or large parts, and even prototype casting! In 2015 our aluminum sand foundry's name was changed slightly to Aluminum Castings Company LLC, but no major changes were made. In November of 2018 Aluminum Castings Company purchased and restructured the operating assets of Alcast Company Midwest Works LLC in Fairfield IA to further improve our aluminum casting offerings.